Email threading has been popularized by Google Gmail service. Email threading means that an email conversation, i.e. an email, and all the answers to it are kept together. It is also used in Internet forums, boards and newsgroups where messages are grouped according to some topics. A set of messages grouped in this way is called a topic thread or simply "thread". A discussion forum, e-mail client,Social networking site such as Facebook or news client is said to have "threaded topics" if it groups messages on the same topic together for easy reading in this manner. This website contains a free and extensive online tutorial by Bernd Klein with material from his live Python courses. You can attend one of his courses in Paris, London, Toronto, Berlin, Munich, Hamburg, Amsterdam, Den Haag (The Hague) or Lake Constance / Zurich. Any sufficiently complicated C or Fortran program contains an ad hoc, informally-specified, bug-ridden, slow implementation of half of Common Lisp. Sounds complicated? Lisp is complicated. Guido van Rossum compared it - or to be precise Common Lisp and Scheme - to Python with the following words: "These languages are close to Python in their dynamic semantics, but so different in their approach to syntax that a comparison becomes almost a religious argument: is Lisp's lack of syntax an advantage or a disadvantage? It should be noted that Python has introspective capabilities similar to those of Lisp, and Python programs can construct and execute program fragments on the fly. Usually, real-world properties are decisive: Common Lisp is big (in every sense), and the Scheme world is fragmented between many incompatible versions, where Python has a single, free, compact implementation." "Things in Python are very clear, but are harder to find than the secrets of wizards. Things in Perl are easy to find, but look like arcane spells to invoke magic." Next Chapter: Pipe, Pipes and "99 Bottles of Beer"
A Thread or a Thread of Execution is defined in computer science as the smallest unit that can be scheduled in an operating system. 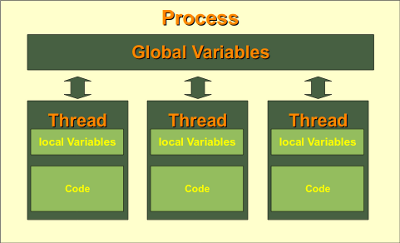 Threads are normally created by a fork of a computer script or program in two or more parallel (which is implemented on a single processor by multitasking) tasks. 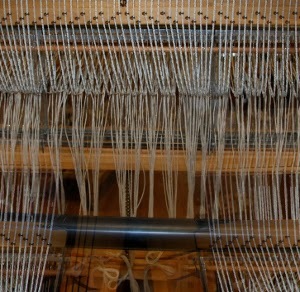 Threads are usually contained in processes. More than one thread can exist within the same process. These threads share the memory and the state of the process. In other words: They share the code or instructions and the values of its variables. Kernel Threads are part of the operating system, while User-space threads are not implemented in the kernel. In a certain way, user-space threads can be seen as an extension of the function concept of a programming language. So a thread user-space thread is similar to a function or procedure call. But there are differences to regular functions, especially the return behaviour. Every process has at least one thread, i.e. the process itself. A process can start multiple threads. The operating system executes these threads like parallel "processes". On a single processor machine, this parallelism is achieved by thread scheduling or timeslicing. Multithreaded programs can run faster on computer systems with multiple CPUs, because theses threads can be executed truly concurrent. Threads of a process can share the memory of global variables. If a global variable is changed in one thread, this change is valid for all threads. A thread can have local variables. Please note: The thread module has been considered as "deprecated" for quite a long time. Users have been encouraged to use the threading module instead. So,in Python 3 the module "thread" is not available anymore. But that's not really true: It has been renamed to "_thread" for backwards incompatibilities in Python3. The module "thread" treats a thread as a function, while the module "threading" is implemented in an object oriented way, i.e. every thread corresponds to an object. This method starts a new thread and return its identifier. The thread executes the function "function" (function is a reference to a function) with the argument list args (which must be a list or a tuple). The optional kwargs argument specifies a dictionary of keyword arguments. When the function returns, the thread silently exits. When the function terminates with an unhandled exception, a stack trace is printed and then the thread exits (but other threads continue to run). """Calculates the square root of a"""
The raw_input() in the previous example is necessary, because otherwise all the threads would be exited, if the main program finishes. raw_input() waits until something has been typed in. We expand the previous example with counters for the threads. The script above doesn't work the way we might expect it to work. What is wrong? The problem is that the final while loop will be reached even before one of the threads could have incremented the counter num_threads. The first thread reads the variable num_threads, which still has the value 0. After having read this value, the thread is put to sleep by the operating system. Now it is the second thread's turn: It also reads the value of the variable num_threads, which is still 0, because the first thread has been put to sleep too early, i.e. before it had been able to increment its value by 1. Now the second thread is put to sleep. Now it is the third thread's turn, which again reads a 0, but the counter should have been 2 by now. Each of these threads assigns now the value 1 to the counter. Similiar problems occur with the decrement operation. Problems of this kind can be solved by defining critical sections with lock objects. These sections will be treated atomically, i.e. during the execution of such a section a thread will not be interrupted or put to sleep. The beginning of a critical section is tagged with lock_object.acquire() and the end with lock_object.release(). Method of operation of the threading.Thread class: The class threading.Thread has a method start(), which can start a Thread. It triggers off the method run(), which has to be overloaded. The join() method makes sure that the main program waits until all threads have terminated. The previous examples of this chapter are of purely didactical interest, and have no practical applicability. The following example shows an interesting application, which can be easily used. If you want to determine in a local network which addresses are active or which computers are active, this script can be used. 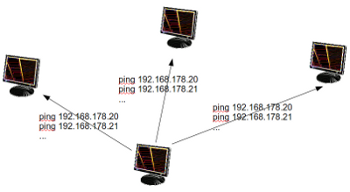 But you have to be careful with the range, because it can jam the network, if too many pings are started at once. Manually we would do the following for a network 192.168.178.x: We would ping the addresses 192.168.178.0, 192.168.178.1, 192.168.178.3 until 192.168.178.255 in turn. Every time we would have to wait a few seconds for the return values. This can be programmed in Python with a for loop over the address range of the IP addresses and a os.popen("ping -q -c2 "+ip,"r"). A solution without threads is highly inefficient, because the script will have to wait for every ping. PING 192.168.178.26 (192.168.178.26) 56(84) bytes of data. PING 192.168.178.23 (192.168.178.23) 56(84) bytes of data. return "alive, but 50 % package loss"